Celina’s Karissa Frederick dives for a fly ball against Bath during Tuesday’s game at Bath High School. Bath’s Tori Dackin gets under a fly ball against Celina during Tuesday’s game at Bath High School. Celina’s Emily Keith pitches against Bath during Tuesday’s game at Bath High School. 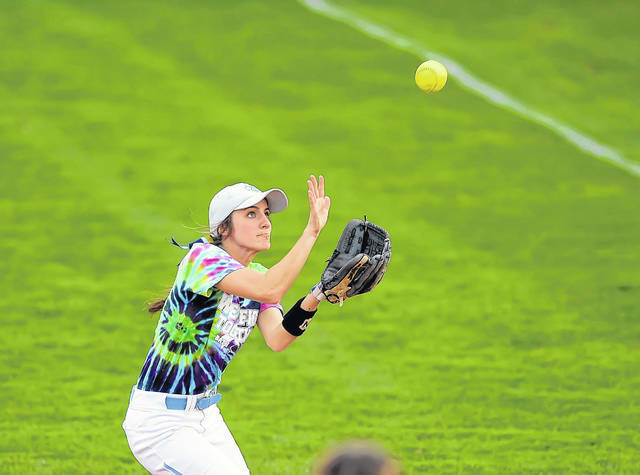 BATH TOWNSHIP – With the go-ahead run on base in extra innings of Celina’s 6-5 softball win over Bath on Tueday the Bulldogs’ leadoff hitter Emily Keith was confident when she went to the plate. And not just because her first four at bats had produced two solo home runs, a double and an intentional walk. She was exactly where she wanted to be and that figured into the equation, too. Celina loved it when Keith launched a double to right center field to score Harlee Harris with the deciding run in an 8-inning game that turned dramatic just when it looked like it might be routine. 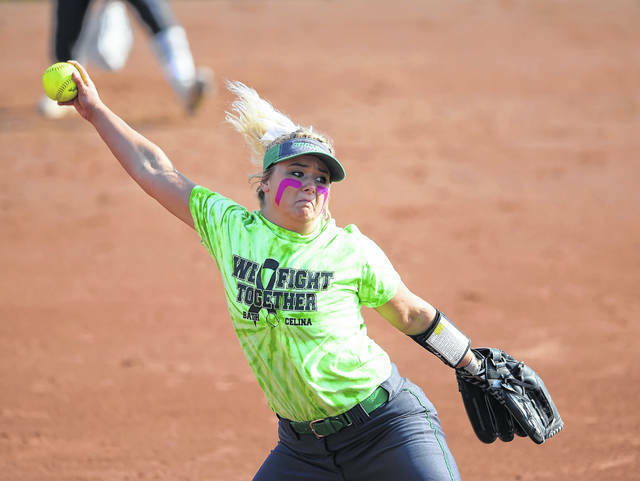 Celina led 5-0 after 5 ½ innings, but Bath scored once in the bottom of the sixth inning and got four more runs in the seventh to send the game into extra innings. Celina (8-4, 5-0 Western Buckeye League) remained tied with Defiance for the WBL lead with its win. Bath is 10-4 overall and 3-2 in the WBL. The Bulldogs struck early when Keith hit a long home run to left field on the first pitch of Tuesday’s game and their lead grew to 2-0 when she homered to center field in the third inning for her sixth long ball of the season. Taylor Turner’s three-run home run in the top of the fifth inning made it a 5-0 game. Keith, Celina’s starting pitcher, allowed only one run and four hits through the first six innings. But Bath used a single by Tori Dackin, a triple by Chandler Clark, a single by Riley Iiames, a double by Kali Armstrong and an error on an infield grounder by Emily Rocca to tie the game 5-5 in the bottom of the seventh. Maddy Luebke came in to pitch and got the final out of the seventh inning and was the winning pitcher after getting three outs in the eighth. “This was a tough game coming in here. It’s been a while since we won on their home field. We knew there was no way Bath was going to settle for a 5-0 shutout. They’re going to come back and they did,” Driggs said. Celina’s game-winning rally started when its No. 9 hitter Harris drew a two-out walk, which brought Keith to the plate. Bath considered intentionally walking Keith again, as it had in the sixth inning, but decided against it. Keith said her focus as Bath met at the pitcher’s circle to discuss how to pitch to her was just that she wanted a chance to swing the bat. “I wanted them to pitch to me. I really, really wanted them to pitch to me. I wanted to do it for my team. I knew I had the opportunity to do it for my team,” she said. 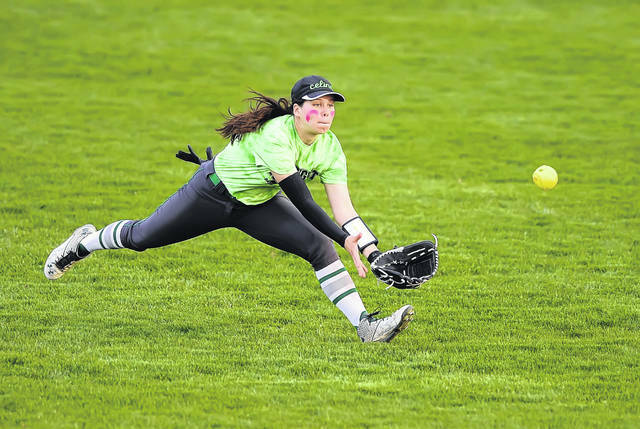 https://www.limaohio.com/wp-content/uploads/sites/54/2019/04/web1_Bath-vs-Celina-RP002-1.jpgCelina’s Karissa Frederick dives for a fly ball against Bath during Tuesday’s game at Bath High School. https://www.limaohio.com/wp-content/uploads/sites/54/2019/04/web1_Bath-vs-Celina-RP005-1.jpgBath’s Tori Dackin gets under a fly ball against Celina during Tuesday’s game at Bath High School. https://www.limaohio.com/wp-content/uploads/sites/54/2019/04/web1_Bath-vs-Celina-RP008-1.jpgCelina’s Emily Keith pitches against Bath during Tuesday’s game at Bath High School. This entry was tagged bath, celina. Bookmark the permalink.